Pakistan security officials examine the site of suicide bombing at the police emergency call center in Islamabad, Pakistan on Saturday, June 6, 2009. A suicide bomber attacked a police building in Pakistan's capital Saturday, blowing himself up in a courtyard after being shot by officers as he ran toward them, officials said. Rescue teams arrived shortly after, hastening the wounded to the nearby Pakistan Institute of Medical Sciences hospital as investigators combed the scene for evidence. Debris from the blast was scattered in a wide radius, with pellets packed into the bomber's vest found as far as a few hundred yards away. Cabins located on one side of the compound were badly damaged and charred. It was the first attack on Islamabad since March 23, Pakistan National Day, when a suicide bomber struck the headquarters of the Special Branch  a special police investigative unit  killing a guard who tried to stop the attacker. Law enforcement authorities in the capital have been bracing themselves for militant attacks since the army launched a wide-ranging military operation in the Swat Valley and two neighboring districts in a bid to wipe out the Taliban. Manned entries to the city have been beefed up with increased numbers of policemen searching vehicles, while sentries at all checkpoints lying athwart main roads have been given instructions to exercise greater vigilance. Since last September's deadly Marriott hotel blast, which killed over 60 people, the denizens of this once somnolent capital are taking no risks. Over recent months, the streets of Islamabad's well-heeled neighborhoods have been dotted with concrete barriers, and enormous blast walls now block entire buildings from public view. Saturday's attack has heightened fears that there may be more to come as militant terror spreads geographically. A day earlier, a suicide bomber killed more than 30 people in a mosque near the Swat Valley as they were gathered for Friday prayers  the most important weekly event for religious Muslims. While there has been no claim of responsibility yet, the victims were from Hayagai Sharqi in Upper Dir, a mountainous village that has a reported history resisted Taliban influence. It was the first time that the district of Upper Dir has been hit. 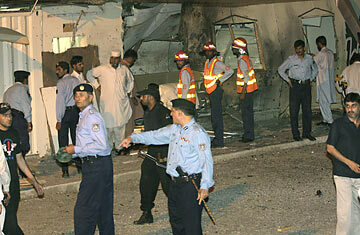 Last month, the cities of Lahore and Peshawar were rocked by massive blasts on successive days. The attack on Lahore targeted the office of the city's police chief and the regional headquarters of Pakistan's main intelligence agency, the Inter-Services Intelligence, commonly known as the ISI. At least two dozen people were killed by the blast that caused widespread damage and injured over 300. The Taliban later claimed responsibility. Hakimullah Mehsud, a deputy of notorious Taliban commander Baitullah Mehsud, warned the residents of major cities to flee before they struck again. "We want the people of Lahore, Rawalpindi, Islamabad and Multan to leave those cities as we plan major attacks against government facilities in coming days and weeks," Mehsud told the Reuters news agency. Moments after Saturday's attack in Islamabad, Interior Minister Rehman Malik condemned the suicide bombing as "a cowardly attack" mounted after "the defeat" of the Taliban in Swat. While the army has claimed a flurry of successes, including clearing the main town of Mingora and killing more than 1,300 Taliban fighters, a decisive victory is yet to be achieved. The army says that it is still facing "pockets of resistance," and the senior leadership remains elusive. Many of the militants have fled the area, believed to have melted away into the valley's snow-capped mountains, the tribal areas or escaped with the estimated three million refugees. Earlier on Saturday, a military convoy carrying two prominent cohorts of Sufi Mohammed, the hardline pro-Taliban cleric the government once negotiated with, came under attack and the pair was killed. As the vehicle made its way past the notorious gun-running town of Sakhakot, a roadside bomb exploded and militants opened fire. One of the men inside was Ameer Izzat Khan, Sufi Mohammed's fast-talking spokesman, who is considered one of the most senior militants killed so far. There is confusion over whether the attacking militants were trying to rescue the pair, or kill them before the military interrogated them. Analysts believe that the militants are intent on spreading violence in attempts to seek revenge and break down the fragile public consensus behind the army's fight against the Taliban. Though the Pakistani army, political class, and broad sections of the population have displayed a new resolve to crush the Taliban, there are also worries that if the challenge posed by the alarming refugee crisis is not tackled soon, that support could start to dissipate.